Cooking in the crockpot is so easy and comforting. The house is filled with nice aromas all day long. 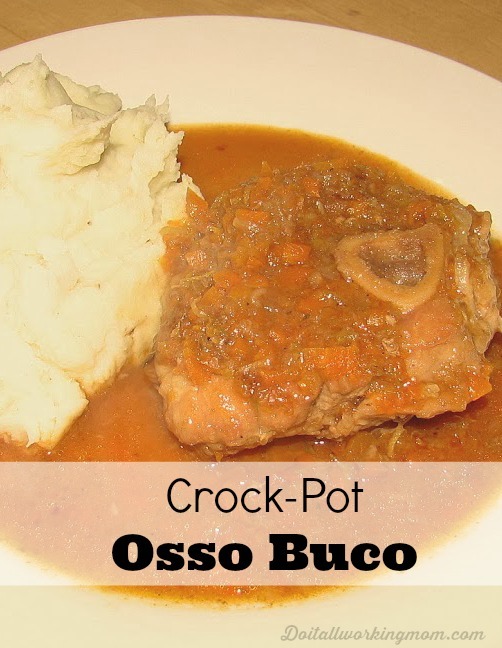 I made this Crockpot Osso Buco recipe from Ricardo’s slow cooker cookbook and it’s really good. I did make some changes to the recipe to satisfy my taste. Coat the shanks with flour, and brown them on each side until golden brown. Season with salt and pepper and add to the slow cooker. Deglaze with the white wine and add to the slow cooker. Add the rest of the ingredients. Mix well. Season with salt and pepper. It’s that easy! The meat is really tender and the sauce is so tasty! Serve with mashed potatoes (see my perfect Mashed Potatoes recipe HERE). Makes a great Sunday meal. I have found that any food cooked with wine doesn’t sit good with me. It looks and sounds great though.